All the cards are the same as in normal Euchre: 9, 10, J, Q, K, A of each suit. Euchre is a trick-taking game. The non-dealer has the opportunity to call trump or pass. If they pass, the dealer is forced to choose (like in “screw the dealer” in normal Euchre). Once trump is chosen, the non-dealer leads normal play. To reiterate, it doesn't matter who chose trump — the non-dealer always leads. Each player must follow suit, playing from the face-up cards in front of them on the table or in their hand. When a card on the table is played, the card below it (if there is one) is turned over once the trick is complete. There are twelve tricks to be played. To win the hand, you must take 7 of the 12 tricks. Each player gets one point for each trick they took. If the trump-caller fails to take 7 tricks, they have been “Euchred”, and the other person gets all 12 points. The game is over when one player reaches 31 points. Reneging. If you, or your opponent, realizes that one of you has played out of turn, played a card that they shouldn’t have, or made some other similar error, it is called reneging (it’s pronounced like renegging, with a short e or short i sound). When that happens, the player who made the mistake loses the hand immediately, and the opposing player gets 12 points. In other words, it’s the same as getting Euchred. Don’t do it! Remember that you have cards in your hand that the other player can’t see. That sometimes will determine who wins. Play works the same as outlined above, except each player has five sets of two cards on the table, with two in the hand. Get rid of the 9s, then deal three set of two in front of each player, and three for each player's hand. Two cards will be left over. The dealer turns over the top card, representing trump. The other player can accept it or pass; if either player accepts the trump, the dealer has the opportunity to exchange one of his face-up or in-hand cards for the turned-up trump card. If neither player accepts the turned-over card, it is turned over, and they choose one of the remaining three suits for trump, as normal. Same as above, only keep the 9s, and each player has three groups of two cards on the table, with five cards in the hand. Deal each player three sets of two cards on the table, five in each hand, leaving two. Turn over the top of these two leftovers, which is your trump to bid on. 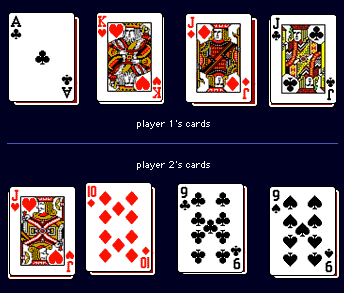 If neither player takes it, the card is turned over, and non-dealer can choose from the remaining three suits as usual. There's also a variation on scoring that's more like regular Euchre (where you use 2 five cards). Instead of 31 points, you play to 10 with the following point assignments: take 7 tricks, get 1 point; 8 tricks, 2 points; 9 tricks, 3 points; 10 or more; 4 points. The person who calls trump is the only one who can earn points unless he is Euchred. If that happens, the other player wins two points for that round. This scoring method doesn't require paper, which is nice, although it does require remembering something slightly more complicated than 1 trick equals 1 point. This page has gotten a fair amount of attention from people who can't always scare up enough others to play four-handed Euchre, and while I'm glad to offer it, I've had some help. Thanks to Steve from Ottawa, IL for originally teaching us this variation on Euchre. Thanks to Amanda for helping clear up some confusion. Thanks to Mike Peters, Mike Miller, and Michele (so many Ms!) for the variations.